Go North East is applauding the generosity of its workforce after three teams donated over £400 in cash prizes from their internal awards to charities and fundraising initiatives close to their hearts. 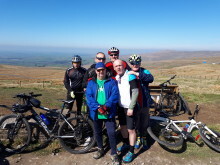 The company’s ‘team of the year’ gave £150 to Cancer Research UK, ‘runner up depot of the year’ donated £200 to a Coast-to-Coast fundraiser for North East hospice, St Benedict's and ‘runner up team of the year’ contributed £50 to fund a commemorative bench in memory one of their team members. Go North East driver, Kerry Richardson, sadly passed away from acute leukaemia in January aged just 30. After winning the ‘runner up team of the year’ award, colleagues at the Washington depot put their cash winnings towards the commemorative bench. A pub quiz was also arranged to raise additional funds resulting in a total of £493 – enough to purchase the bench which will be placed outside of the depot in Kerry’s honour. 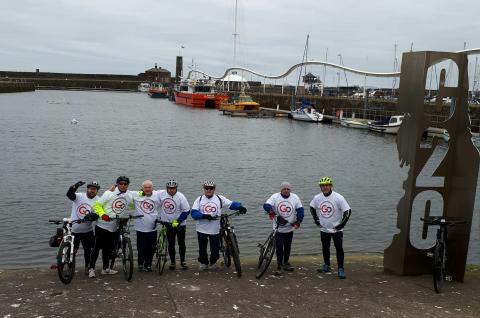 Also in receipt of the ‘runner up depot of the year’ prize, the team at the Washington depot kindly gave a fundraising boost to seven colleagues by donating their cash winnings to the drivers’ grueling Coast-to-Coast cycling challenge. The epic cross country journey is being undertaken this month, in aid of St Benedict’s Hospice in Sunderland. Go North East’s ‘team of the year’, the Riverside Run Out team, which is responsible for dealing with any issues before the buses embark on their daily journeys, chose to gift their prize money to Cancer Research UK as each member has at some point in their lives, been affected by a loved one’s diagnosis of the disease. The ‘team of the year’ accolade recognised the efforts of the eight team members who ensure the fleet of buses departing Go North East’s largest depot – the flagship Gateshead Riverside, leave on time each morning. Carolyn Reynolds, local fundraising manager for Cancer Research UK received the cheque from the Riverside Run Out team at the depot. She said: “One in two of us will hear the words ‘I’m sorry, it’s cancer’ in our lifetime. So it’s really important that we keep up the fight, and Go North East are helping us to do just that. “Cancer Research UK works right here at our labs in Newcastle – less than a mile away from Riverside - doing the groundbreaking research that will help more people survive over 200 different types of cancer. Go North East’s team awards took place at the Centre for Life where almost 200 of its people celebrated as the organisation paid tribute to everyone who has gone above and beyond. And teams from across the company regularly find ways to go above the call of duty for worthwhile causes, while still fulfilling their day-to-day functions. 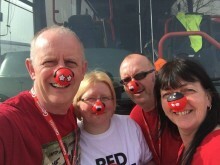 This Red Nose Day, trainee drivers took to the wheels of their training vehicles wearing red noses while the team at Gateshead Riverside baked, ate and dressed up for the occasion, raising over £155 for Comic Relief. Will Sewell at Go North East said: “We’re extremely proud of all our teams for their generosity and ongoing commitment to fundraising for a wide variety of good causes, such as the donation to Cancer Research UK. Cancer is a disease which impacts us all and within the Riverside Run Out team we felt very passionately that we wanted to donate our prize fund to a charity where it would have a local impact.